All day trading markets have margin requirements which set the minimum amount of cash or equity that needs to be maintained in a trading account in order to trade that market. Minimum margin requirements are set by exchanges or regulatory bodies, but brokers may have margin requirements over and above the required minimum. What Is a Futures Margin Call? A margin call is when your day trading brokerage contacts you to inform you that the balance of your trading account has dropped below the margin requirements for one of your active trades. There are three types of margin, only one of which is relevant to day traders. Initial and maintenance margin are relevant to traders who hold futures positions overnight. In order to hold a position overnight you must have enough capital in your account to cover the initial margin to enter a position. Initial margin varies by the futures contract being traded. Maintenance margin is the minimum balance the trader must have in the account to keep the position open. If the account loses money and the balance drops below the maintenance margin level (also varies by contract), then the trader will receive a margin call. A margin call is when the broker asks the trader to deposit enough capital to bring the account balance up to the required maintenance margin requirement for the positions being held. Day traders don't worry about initial or maintenance margin, as there are special margin requirements for day traders: intraday margins. Intraday margin is typically much smaller than initial and maintenance margin, because it only applies to positions that won't be held overnight (very short-term trades). As an example, NinjaTrader has an initial margin of $4620, a maintenance margin of $4200 and an intraday margin of $500 for trading the E-mini S&P 500 futures (ES). As long as a day trader has more than $500 in their account, they can day trade this futures contract. If their balance falls below $500 though--even due to a live trade which is losing money--then the trader is in a margin call scenario. What Is a Stock Market Margin Call? If you trade stocks on leverage (borrowed money) you could face a margin call scenario. In the US your broker can provide you with up to 2:1 leverage on overnight positions, and 4:1 leverage on day trading positions. This can vary by stock price though, and by broker. When holding overnight positions you must maintain an equity balance greater than 25% of the value of your securities. Equity is the value of your securities minus the amount borrowed to fund a stock purchase. Most stock brokers actually require a maintenance margin of more than 25%; typically 30% to 40%, and higher on penny stocks. Day traders must maintain an equity balance of at least $25,000 in their account at all times. If their equity balance (security value minus borrowed funds) falls below $25,000 they can't day trade. Margin calls originally got their name because the brokerage would call the trader on the telephone. Most day trading brokerages no longer make margin phone calls. 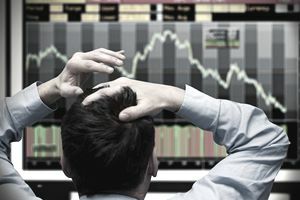 Instead of contacting the trader to inform them of the margin call, many brokerages will automatically exit the offending trade in an attempt to mitigate losses and the possibility that the trader losses more than they have in the account. Check with your broker to see if you will receive a margin call (or warning), or if positions are automatically closed if you fail to meet the margin requirement for your positions. Professional traders should never experience margin calls. Margin calls are only received when a trade has lost so much money that the exchange or broker wants more money as collateral to allow the trade to continue. A professional trader should be managing their trades well enough that they never allow a trade to become this much of a loser. Margin calls are most often experienced by amateur buy and hold investors, because once they enter their trades (typically by buying a stock), they will hold the trade no matter what the market does...even if it drops like a rock. Amateur investors typically deposit funds to meet the margin call and maintain their losing positions. Professional traders liquidate losses and rarely meet a margin call on a position that has yet to move as expected (and has in fact gone the opposite way).